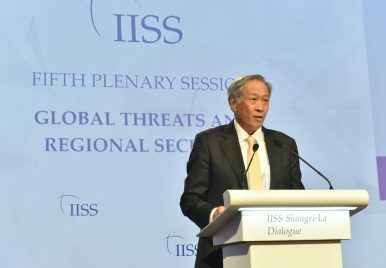 During his address at the 2017 Shangri-La Dialogue (SLD), Singapore’s Defense Minister Ng Eng Hen unveiled a series of defense initiatives that Singapore would seek to promote during its ASEAN chairmanship. While several of these have already been mulled or tabled in earlier years along with some others, it is worth exploring what the city-state itself is prioritizing during its leadership and what accounts for that. First, Ng said Singapore will initiate the inaugural ASEAN-China maritime exercise. The idea of such an exercise is not new. It has been mulled by both sides for years, and China formally proposed it as one of five ideas for boosting ties during the inaugural ASEAN-China Defense Ministers’ Informal Meeting (ACDMIM) in October 2015 in Beijing. Though the idea seemed unlikely at the time given the resistance from several Southeast Asian states, some have since warmed to at least exploring the idea. It will be interesting to see how the exercise plays out. As I noted when it was first broached, indications were that it would be quite limited in scope – involving areas like maritime search and rescue and disaster relief – and that it will not be without its challenges, whether it be the lack of trust or where exactly they will be conducted (especially given the areas with contested claims) (See: “The Truth About China’s New South China Sea Drill Proposal with ASEAN”). Second, he announced that Singapore will expand the Code for Unplanned Encounters at Sea (CUES) to all ADMM-Plus countries, which includes the ten Southeast Asian states along with the United States, China, Australia, India, Japan, New Zealand, South Korea, and Russia. This, too, builds off of previous initiatives. As I have noted before, CUES, which was initiated at the Western Pacific Naval Symposium back in April 2014, has already been practiced by several countries during their exercises, including the United States, China, and Japan. It would therefore make sense to try to formalize the acceptance of these rules of the road for all countries. While Ng did not mention this in his speech, it is nonetheless worth noting here that apart from expanding CUES to include more countries, Singapore has also been one of the leading voices calling for broadening CUES to cover non-naval vessels, including white shipping, coast guards and fishing vessels, as well as the underwater domain (See: “Where is Singapore’s New Underwater Naval Protocol?”). Though the non-naval vessels expansion makes sense given the fact that confrontations in flashpoints like the South China Sea have often involved non-military vessels, there is still some resistance to this, including by China (hardly surprising, since Beijing has employed new, large coast guard ships painted white rather than Navy Grey, and smaller ships have been manned by militia believed to be organized by it as well). There are also some sensitivities that did crop up initially as Singapore proposed underwater CUES due to the fact that this would involve inherently stealthier capabilities like submarines, even though information-sharing would not be focused on exact submarine locations. Third and finally, Singapore will guide the regional grouping to establishing a set of guidelines for air encounters between military aircraft for ASEAN, similar to that in the U.S.-China Memorandum of Understanding on the Rules of Behavior for Safety of Air-to-Air Encounters back in September 2015. This, too, was no surprise. Even though several of Singapore’s recent security proposals, be it on underwater CUES or submarine rescue, have focused on the maritime realm, Ng has also been repeatedly stressing the importance of keeping the aerial domain in mind. He has in fact directly suggested several times that this sort of agreement should be inked, and he is not alone in believing that the U.S.-China agreement is a good model. Apart from these three initiatives, Ng also said that Singapore and Vietnam had proposed that ADMM-Plus be annualized in order to better equip the grouping – the outgrowth of the ADMM which is the region’s premier venue for defense and security issues – to deal with urgent challenges. Ng’s proposal is one that has support not just among some ASEAN members but also among several of the ‘Plus’ members as well. It would also be in line with a broader calibrated effort to increase the frequency of the meetings as needed. It is worth recalling that ADMM-Plus was originally meant to be held every three years when it was first conceived in 2007, with the first one being held in 2010. It was then quickly moved to every two years starting in 2013 following a decision by the ministers in Cambodia in 2012, and given the importance that has been attached to it, annualizing it would seem to make sense. One thing that was missing from Ng’s speech – whether in the form of new proposals or making progress on existing ones – was the South China Sea. Indeed, remarkably, there was not a single mention of the phrase South China Sea anywhere in his remarks. That is not entirely surprising given a confluence of factors, including the softening of the Philippines’ own South China Sea position (which has predictably generated reverberations across the region), the city-state’s own struggle to manage its relationship with China of late amid Beijing’s strong-arming, and uncertainty about the United States’ own role in the region. And, to be fair, Singapore has already done its fair share in helping ASEAN move through a tumultuous period in ties with China on the South China Sea question, as I have related before, including on in the ever-elusive quest for a code of conduct (See: “What Really Happened at the ASEAN-China Special Kunming Meeting”). It will be interesting to see how the city-state leads ASEAN through an especially uncertain Asian security environment next year. Singapore’s ASEAN Chairmanship: What’s on the Security Agenda?What’s Next for US-Singapore Ties Under Trump?What to Expect From the 2017 Shangri-La Dialogue in SingaporeWhat’s in the New ASEAN Air Encounter Code?What’s in the New ASEAN Armies Workshop?